Paul Rudd may be making his way to the world of video game movies in the very near future. The Ant-Man and the Wasp star is reportedly being eyed for a lead role in the upcoming Sonic the Hedgehog movie, which is being put together at Paramount Pictures following Sony abandoning the project after years of development with nothing to show for it. Paramount, on the other hand, isn't wasting any time as the movie is set to begin filming this summer and will arrive in theaters next year. Now, it appears as though they have their eyes on a big star to help add to the project's appeal. 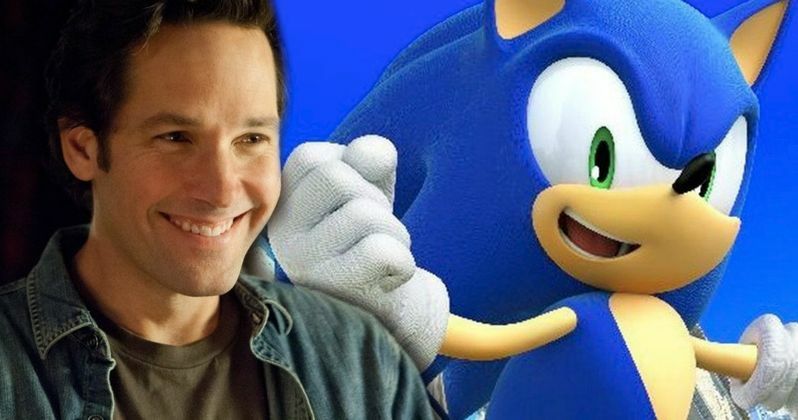 Details on the Sonic the Hedgehog movie are currently a bit scarce, but it's being reported that Paul Rudd, should he ultimately sign on for the role, will play a cop named Tom. In the movie, Tom will team up with Sonic and, though the specifics of the plot haven't been laid out just yet, they're likely going to be facing down the blue video game hero's most notable foe, Dr. Robotnik, aka Eggman. Sonic the Hedgehog is going to be a blend of live-action and CGI and represents a significant play for a potential franchise by Paramount. Not only because the video game property is extremely recognizable on a global scale, but because they're reportedly looking to spend $90 million producing the movie. That's a hefty production budget, especially considering that video game movies aren't quite like comic book movies, at least not yet. History tells us that video game movies don't usually land with critics and they fail to meet expectations at the box office. But Sonic may be able to change that. Having a likable star like Paul Rudd on board certainly can't hurt. Jeff Fowler makes his directorial debut with Sonic the Hedgehog. Deadpool director Tim Miller, who is currently busy working on Terminator 6 with James Cameron, is on board as an executive producer. Even though he isn't directing, that is a credit to the project. The screenplay comes from Josh Miller, who mostly has credits on low-budget affairs like Dorm Daze and Transylmania, but also worked on the YouTube Red series 12 Deadly Days. So the core creative team, save for Miller, is largely untested when it comes to a project of this size. Sega first introduced Sonic the Hedgehog to the world in 1991 and, in the years since, the character's various titles have sold more than 360 million copies worldwide. While Sega has had their share of issues as a company, their signature character has remained popular for pushing three decades. So if you're going to try and turn a video game into a franchise, why not go with Sonic? Paramount is set to release Sonic the Hedgehog in theaters on November 15, 2019. We'll be sure to keep you up to date as more details on the project are made available. This news comes to us courtesy of That Hashtag Show.